Vinyl Soft Play Area Products - We offer vinyl soft play blocks for all ages, made of dense virgin polyurethane foam that meets all US and European Flammability requirements. Choose from Baby and Toddler Blocks, Large Blocks, Building Blocks and More! Perfect for Play areas and more at Hotels and Resorts, Daycares and Home use. We offer vinyl soft play blocks for all ages, made of dense virgin polyurethane foam that meets all US and European Flammability requirements. 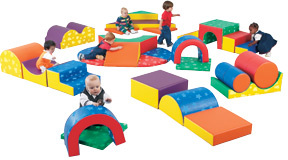 Choose from Baby and Toddler Blocks, Large Blocks, Building Blocks and More! (Set of 12).Teenie, tiny marshmallow soft blocks for baby and toddler hands. Available in Primary and Pastel Colors. Each Block is 5 1/2". 5-1/2” softly safe cubes with 6 different color dots on 6 different sides of each cube. Perfect for mix‘n match and color discrimination. Exercise growing minds with endless matching combinations. Wipe clean vinyl encased urethane. 7 piece set of Sturdiblocks, perfectly sized for crawlies to toddlers. Primary and secondary colored soft cubes. Four 8” cubes, two 8” x 8” x 16”, one 8” x 16” x 16” . 9” soft modules for designing buildings or structures. Children-sized without the noise of blocks falling down. Discounts available for payments by e-transfer and wire transfer.